I feel accomplished to have used almost ALL of this box before it was time to pick up the next! 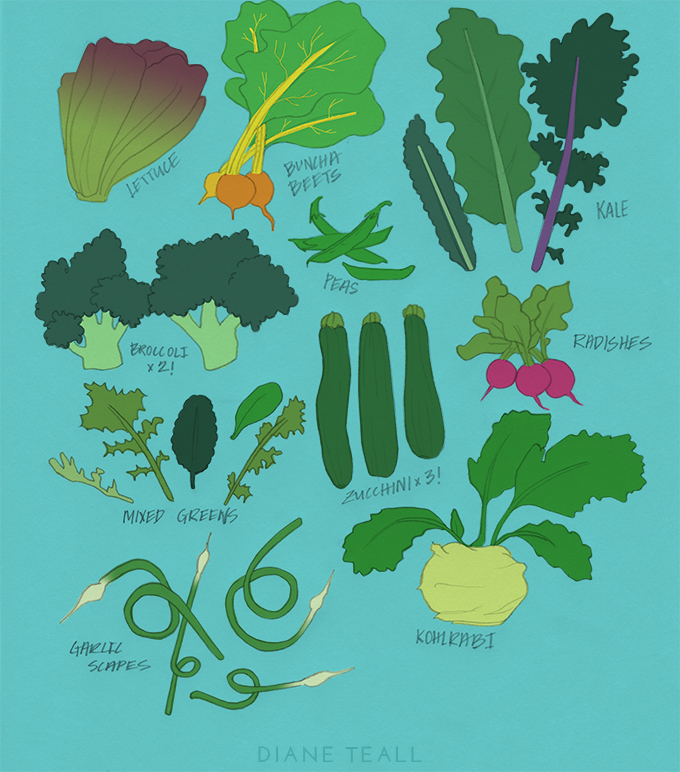 The kohlrabi still has me stumped! Now that we’re in the thick of growing season our CSA box is getting bigger each week. When we don’t feel like turning on the oven big chopped salads have been our go to – mason jar salads for the win! Read on to see what was in the (CSA) box and how we ate through it! Lettuce: I went for a smaller head of lettuce this week and used it as a base for tuna salads. Bunch of golden beets: The greens didn’t look so great this week, so I didn’t end up steaming them. I added the raw ‘lil golden beets to mason jar salads. Mason jar salad on the go! Peas: The entire batch went into a pork and cabbage stir fry with some peppers and mushrooms. Kale: We had our choice between rainbow chard or kale leaves and I decided on several varieties of the kale. Farm fresh, organic kale is so much sturdier and more vibrant than the wimpy leaves in grocery store chains. I steamed it in my rice cooker and sautéed it to go with breakfasts during the week. Broccoli: This went into a stir fry and I also roasted some to have on hand for salads, sides, and loaded chicken and veggie bowls. Below it was a side to one of my favorite dishes right now – Asian Chicken Thighs by Nom Nom Paleo. Zucchini: Maybe I’ll venture out from Zoodles. Not this week! I made spaghetti AND added buttery zoodles to this garlic scape pesto with shrimp dish! Radishes: These went into mason jar salads and atop salsa chicken! Mixed greens: We picked out a .75lb bag from a variety of greens. These crisp, fresh greens are such an upgrade from wilted, wimpy mesclun from the grocery store! I used them in salads (duh) or topped with sunny side up eggs. Breakfast Salad with CSA greens! Garlic scapes: I made another batch of this garlic scape pesto! Kohlrabi: Okay, I admit this one is new to me. I hear I can roast it? Time to Google That Sh*t.
How do you prepare kohlrabi?